Siechem is leading manufacturer of Nuclear Cables. The power cables are manufactured with high purity soft-annealed electrolytic copper conductor with elastomeric insulation. Where the cables are intended for use at high ambient temperature of +150°C (Max.) and high radiation areas, the conductors shall be nickel coated high conductivity annealed copper with Poly Ether Ether Ketone (PEEK) insulated and silicone rubber sheathed cables. Siechem is leading manufacturer of Nuclear Cables. The power cables are manufactured with high purity soft-annealed electrolytic copper conductor with elastomeric insulation. Where the cables are intended for use at high ambient temperature of +150°C (Max.) and high radiation areas, the conductors shall be nickel coated high conductivity annealed copper with Poly Ether Ether Ketone(PEEK) insulated and silicone rubber sheathed cables. Specification: MIL-C- 17, NPCIL, ICEA-S- 73-532, UL 44, UL 1277 & customizedto your specification. 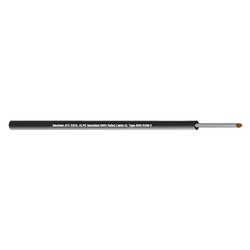 Multicore ATC Conductor EBXL-XLPE Insulated Screened 600 V cable as per UL Type SIS Type SIS/XHHW-2. Anti-acid, anti-oil, anti-sepsis and moisture. ATC Conductor, EBXL-XLPE Insulated & CSPE Sheathed 600 V rated Flat Cable as Per UL Type TC. 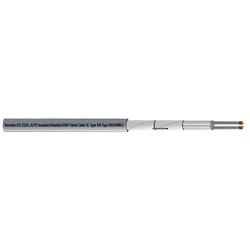 The control cable is a 600 V multi-conductor, thermoset, Class IE rated construction specifically designed for application in nuclear-generating stations and where flame retardancy is critical. For use in class IE power distribution and control circuits for power lighting, control, and signal circuits. ATC Conductor, EBXL-XLPE Insulated & CSPE Sheathed 600 V rated cable as per UL type TC. 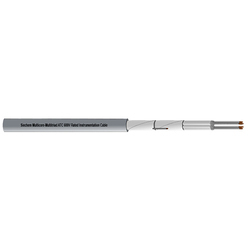 Instrumentation Cable is a 600 V, individual shielded pairs or triads with overall shield, thermo set, Class IE rated construction specifically designed for application in nuclear-generating stations and where flame retardancy is critical. Multicore ATC Conductor, EBXL-XLPE Insulated, ATC Screened & CSPE Sheathed Cable. Power cable is a 600 V multi conductor, thermoset, Class IE rated construction specifically designed for application in nuclear generating stations and where flame retardancy is critical. For use in class IE power distribution and control circuits for power lighting, control and signal circuits. 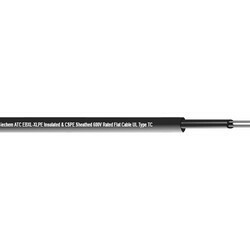 Can be installed in trays, conduit, ducts, or in direct burial applications. Siechem ATC Conductor, EBXL-XLPE Heavy Wall Insulated 600 V rated cable as per UL Type RHH/RHW-2. Power Cable is a 600 V, insulated the dual wall, single conductor class IE rated wire construction specifically designed for application in the nuclear generating station and where additional jacketing protection is required. Insulation: Flame retardant, heat- moisture radiation- resistant, thermoset Cross-Linked Polyethylene (EBXL-XLPE 120oC). Multicore ATC Conductor EBXL-XLPE Insulated & CSPE Sheathed 600 V cable as per UL Type SIS Type SIS/XHHW-2. 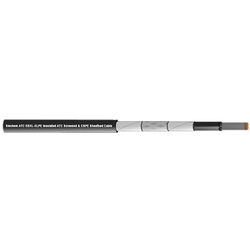 Siechem ATC Conductor, EBXL-XLPE Dual Wall Insulated 600 V rated cable as per UL Type RHH / RHW-2. Power Cable is a 600 V, insulated dual wall, single conductor class IE rated wire construction specifically designed for application in nuclear generating station and where additional jacketing protection is required. Insulation: Flame retardant, heat- moisture radiation- resistant, thermoset Cross-Linked Polyethylene (EBXL-XLPE 120°C).